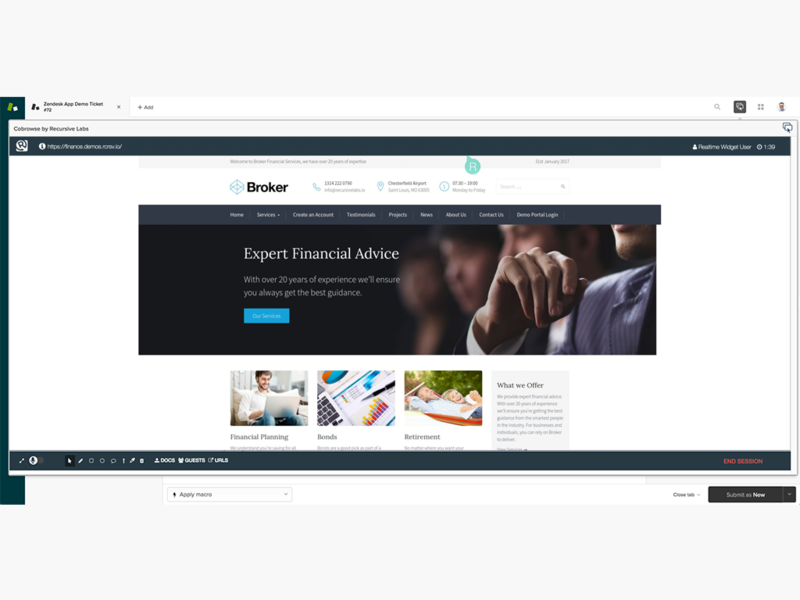 Securely engage with customers using patented cobrowse, video chat and screen share. Recursive Labs is the leader in digital customer engagement. With our patented visual engagement platform, you can interface live with your customers on any device. Our enterprise grade platform allows you to be effective from the consumer all the way to compliance. The Recursive Labs customer engagement solution includes Realtime cobrowse, Replay Interactive Video, Record archiving, and Reply chatbot integration. This patented Visual Engagement Platform is the first cross-device solution built from the ground up for today's security-conscious industries. 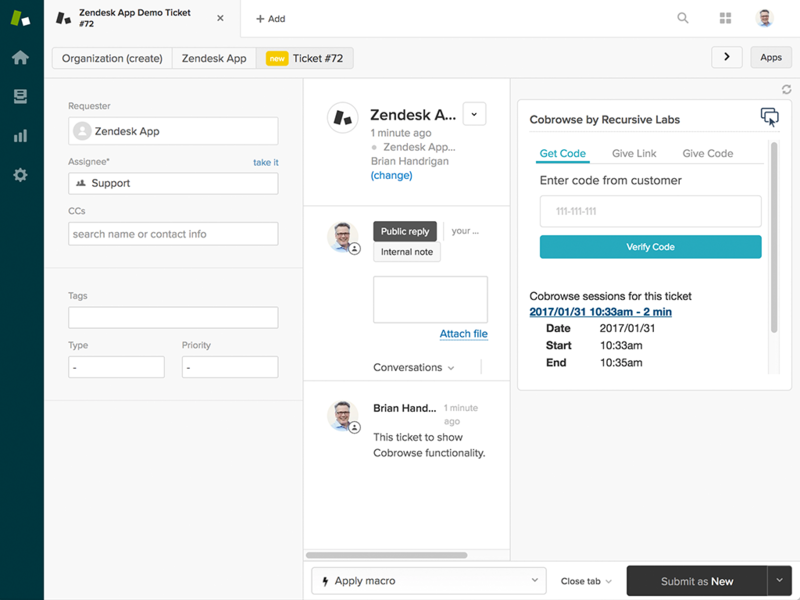 The Recursive Labs Zendesk integration brings these platform features to your agents: - Escalate to cobrowse from Zendesk chat or support with a single click. - Cobrowse with customers directly inside Zendesk; no new tabs or windows. - Automatically attach cobrowsing data to your trouble tickets for reporting/auditing purposes. 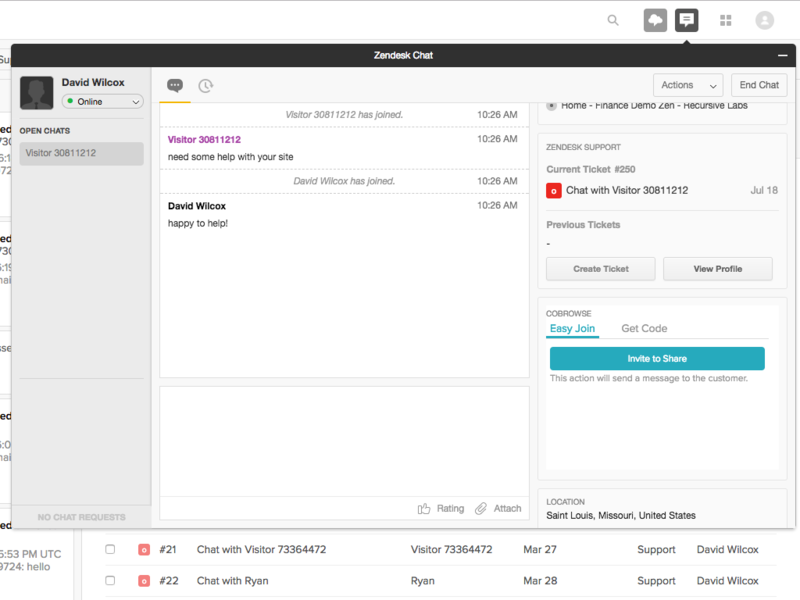 - Turnkey integration with your existing Zendesk Web Widget. You can try this innovative platform for FREE with the Realtime Essential Plan. We offer 3 plans designed to meet the specific needs of your organization: Essential, Team and Enterprise. To determine which option is best for your organization, review our plans and pricing information or speak with a team member today. Ready to empower your agents with cobrowse, video chat and screen share? Pick the right plan for your organization or schedule time to talk with a team member about how cobrowsing and visual engagement could benefit your organization. A Recursive Labs team member will be in touch shortly to help you create an account.